The S&P 500 hit yet another record today thanks to earnings reports and expectations that the Federal Reserve will not raise interest rates until next year. 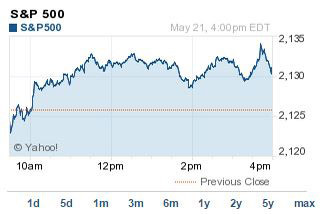 The DJIA Index ticked upward marginally. The S&P 500 Volatility Index (VIX), the market's fear gauge, roughly 6% on the day. On Friday, Federal Reserve Chairwoman Janet Yellen will give a speech on the outlook of the U.S. economy from Providence, R.I., at 1 p.m. today. Investors will keep an ear on her speech, looking for clues on the Fed's interest rate plan following the release of the FOMC minutes on Wednesday. Oil Splurge: S. oil futures rose again on geopolitical concerns in Yemen and Iraq. In addition, geopolitical concerns in Yemen continue to weigh on crude oil prices. WTI crudefutures for July gained nearly 3% to hit $60.69 per barrel. Brent oil was up nearly 2.2% to hit $66.52 per barrel. Looking Abroad: At a time when Greece is likely to leave the European Union, Ukraine's hopes for joining the EU are being dashed by Germany's Chancellor Angela Merkel. Ukraine Foreign Minister Pavlo Klimkin said this week that he anticipates the EU's meeting with six former Soviet satellites would lead to a temporary membership for the nation. However, Merkel suggested that none of these nations have met the pre-conditions needed to warrant a vote on their status. On Tap Friday: Tomorrow investors will keep their focus on U.S. economic data, which includes the Consumer Price Index. Companies reporting earnings this morning include Deere & (NYSE: DE), Foot Locker Inc. (NYSE: FL), Hibbett Sports Inc. (Nasdaq: HIBB), Campbell Soup Co. (NYSE: CPB), and ANN Inc. (NYSE: ANN). Stocks to Watch No. 1, CRM: Shares of com (NYSE: CRM) didn't need rumors or takeover speculation to drive prices up this morning. Shares of the cloud software company rose 3.9% on the day after the firm reported a profit for the first time in seven quarters. Stocks to Watch No. 2, OCR: Shares of Omnicare Inc. (NYSE: OCR) were up 1.72% on news that the pharmacy benefits manager will be purchased by CVS Health Corp. (NYSE: CVS). The all-cash deal is expected to be worth roughly $10.4 billion, or $98 per share. The deal rises to $12.7 billion when including debt assumption. Shares of CVS rose 2.39%, and the company expects the deal will boost its customer base of aging prescription patients. Stocks to Watch No. 3, HPQ: Shares of Hewlett-Packard Co. (NYSE: HPQ) rose more than 1% in post-market hours on news that the company beat first-quarter earnings expectations. The firm reported $0.87 per share, besting Wall Street calls by $0.02. Stocks to Watch No. 4, AMZN: Shares of com Inc. (Nasdaq: AMZN) jumped 1.83% after the company announced that its Amazon Prime Now one-hour delivery services will not be available in Manhattan. The services guarantees one-hour deliver of groceries, meals, and baked goods.